For Lewis fans, this week's interview piece by John Katsilometes is a gift. Many actors and comedians, when interviewed, will state that they hate watching their own work. No such issue for Jerry Lewis, who sat down last month with Las Vegas Sun columnist John Katsilometes for a piece published this week. Lewis famously collapsed for a “cardiac event” after running the long staircase in Cinderfella in just under 10 seconds. He spent four days in an oxygen tent after that performance. The skills he developed in his stage career, the clown miming in the boardroom scene in The Errand Boy (where he lectures an unseen staff to Count Basie’s “Blues in Hoss’ Flat”) and the seductively comic dance scene with Sylvia Lewis in The Ladies Man, stem from his stage career. 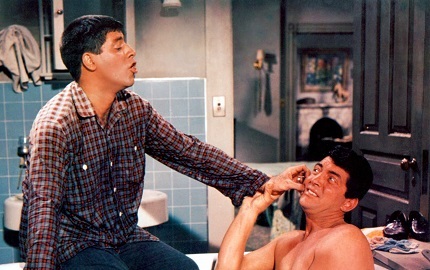 The Museum of Modern Art just completed a March 1-15 retrospective series titled “Happy Birthday, Mr. Lewis: The Kid Turns 90.” The event kicked off with the documentary The Birth of Martin and Lewis, essentially bookending the very warm comments and memories of Dean Martin expressed by Lewis in the Sun piece. Scorsese: So how did you decide to make the video assist? Lewis: I didn’t want to ask anybody, “How was that?” That was something that was against my nature. “How was that?” Jesus, if I don’t know how it is, why am I asking him? But I knew there was a way for me to see what I was doing, so I went to Tokyo, and I met with the Morita family, co-founder of Sony. And the son of Morita stayed with me for four months, working on the video assist. I used it on The Bellboy for the first time. Marty, you know this as well as I do, a lot of directors don’t want to use it because you see how they work, and they don’t want you to see how they work. And there are times when they work, and they don’t want you to see how the work is not great. Lewis: So it became a wonderful protection. They’re not going to fool with the video assist because it’s going to tell you everything. And the beauty of it was, you could tell an actor a hundred times about weight distribution. If you’re standing on your right foot, then I’m getting half an eye. You need to stand here. And then we’d try it and then I’d get another half an eye. You need to put your weight 50 percent here, 50 percent there, and say the line. Now try it. We’d roll video assist. Show it to the actor. Then he’d go onto the set and do it perfectly. I found that to be a tremendous tool. Scorsese: Yes. I think the very first video assist I used was a two-inch black-and-white on King of Comedy. That was the first time I used it – and that was 1981!